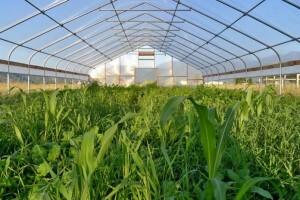 Eight-species cover crop cocktail mix in a high tunnel. Lake County, Montana. The Seasonal High Tunnel Initiative is a voluntary program that provides financial and technical assistance to agricultural producers. The goal of the initiative is to assist producers to extend the growing season for high value crops in an environmentally safe manner. Eligible applicants include individuals, legal entities, Indian Tribes, or joint operations engaged in agricultural production. In addition, organic producers who grow agricultural commodities on eligible land and have natural resource concerns which may be addressed by a seasonal high tunnel may participate in EQIP. See the EQIP website for more information about eligibility for financial assistance. NRCS accepts and processes EQIP applications on a continuous basis. However, each state may establish deadlines for one or more application periods in which to consider eligible applications for funding. Applications submitted after these dates will be evaluated and considered for funding during later funding opportunities. Producers must submit a complete program application and other documentation to support eligibility to be considered for financial assistance through EQIP. Information about how to apply for assistance through EQIP and deadlines specific to the available application periods for each state, is available online. Click on the State where the property that you are interested in enrolling in EQIP is located. This will take you to that State’s Programs home page, which will link to that State’s EQIP page.